I call my demo Never Teach Alone-Finding Writing Mentors in the Picture Books You and Your Students Love! because teaching writing with the support of Carol Minner and the Great Valley Writing Project's network of teacher consultants fuels my desire to grow as a writer and teacher of writers. Collaborating with colleagues and leaning on the wisdom gleaned from Jennifer Jacobson, Katie Wood Ray, Lucy Calkins-the list keeps growing, along with the never-ending supply of excellent writing found in picture books keeps me in good company. I know that I do not have to teach alone! Everything I share is the result of reading, reflecting, writing, and launching during an hour-long, first grade writing workshop. I'm teaching in good company these days. Preparing for a demo is highly reflective, especially when you team up with a fellow TC and are surrounded by writing mentors such as the work of Katie Wood Ray, our primary source for learning how read like a writer. Fellow TC, Tonya Shuford and I planned our sessions to help teachers use picture books as mentor texts. The idea came about from our summer book study of Wondrous Words by Katie Wood Ray. Our planning session at My second office, Starbucks, was filled with laughter and joy of discovering how to foster reading like writers within our sessions. Presenting as a Teacher Consultant with The Great Valley Writing Project is a labor of love. My only regret is that I couldn't attend all of my colleagues' demos. With just a quick peek into today's program resources I'm sure my inner writing thief will be satisfied with the trove of resources ranging from writing in math to argument writing. Teachers teaching teachers combines the wisdom of the entire group. It is not the sage on the stage, but the interactions between the participants facilitated by a Great Valley TC that teachers find so appealing. Teachers discover something new to try on Monday and beyond. Both participants and presenters gain from the professional and collegial gathering-a good day! Let’s face it. Teachers don’t take summers off. However, summers that include the reflective act of writing can rejuvenate our tired teaching souls or is that soles?--my feet are tired too! So stick around and hear about a great way to fill your own writing bucket and enhance the writing experiences of your future students. Last summer, I recaptured the magic of a GVWP Summer Institute the day I signed up for Teachers Write! 2015. I’m not sure how I found out about it, but more importantly, you can find out more about this year’s camp at katemessner.com. Last year at camp, I learned that taking risks has many rewards and the more you participate by sharing your writing with others, responding to others’ work and flexing those writing muscles each day, you can grow as a writer. Although I only participated for one week last summer, this summer I plan to participate for all four weeks of camp. That’s one of the great things about Teachers Write. You can tailor the experience around your summer schedule. Last summer, I was kind of shy and lurked around online, just to see what a digital writing camp was all about. I participated in daily writing exercises, tweeted in Twitter chats, joined a Facebook group called Teachers Write, and created my own blog. On my blog, I wrote about camp, including a poem about stepping back in time on the Bluegrass train of Kentucky. You see, vacation and writing go together. I visited my daughter in Kentucky and made time for writing camp too. I’ve included an FAQ below so you can learn from my experiences last summer and my plans for this year’s camp. I hope you find the FAQ below helpful. What is a digital writing camp? Published authors devote time away from promoting their books to help teachers and librarians develop as writers. They do this via social media such as Facebook and Twitter. It’s a place where you get to look into the writing processes and writerly lives of published authors. It’s free! However, I purchased the three camp leader/authors’ books and some of their guest authors too. It’s helpful to be familiar with their work as they will talk about writing approaches and refer to certain works. When is Teachers Write! 2016? Camp runs June 27 through August 5, 2016. Do I have to commit to the full six weeks? No, you decide when and how to participate. Why do you value Teacher’s Write? I value choice. At Teachers Write! You decide how much and how often you participate. You can even lurk. That’s where you follow along in the background online and write offline for yourself or you can be brave and share your writing with the group. You will receive helpful, supportive feedback and encouragement. You will also want to read and comment on others’ work. It’s a great way to make new friends and learn from each other. Attending camp, gave me the courage to start a blog called Writing Journey13. I’ve included the link to my posts about camp below. I appreciate the encouraging environment that promotes choice. You design and define the writing experience according to your goals. It gets to the heart of what professional development is all about! Visit Kate Messner’s blog at http://www.katemessner.com/teachers-write/ to sign up. 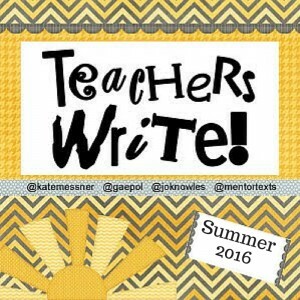 In the spirit of the GVWP Summer Institute, give Teachers Write 2016 a try. You will be a happy camper too! Please check out my blog archive of last year’s camp and leave a comment if you wish. It’s just a little slice of my summer life. Acknowledging myself as a writer didn’t happen overnight, and I strive every day to become a better teacher of writers, but there is only one way to accomplish this goal. It takes practice within a supportive environment, and like anything worthwhile it takes time. But if you carve out a little time to write each day, it will happen. So, what are you waiting for? Join the other campers who are very much like you, dedicated and passionate about teaching writing. Join your writing colleagues this summer to polish up your reading like a writer skills and get ready and energized to teach your students how to read like writers too. Walk away with a new lens to view your favorite books as mentors for your students to stand on while they make decisions about how to structure writing and how to choose wondrous words. Once you read Wondrous Words by Katie Wood Ray, you will read children’s literature with new lenses. You will read like a writer and even better--learn how to teach your students how to read like writers. Studying this book along with your writing peers will be the gift you give yourself and your future students. 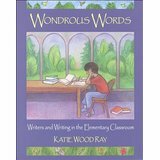 Wondrous Words by Katie Wood Ray was one of NCTE’s most popular books. And under my watch it continues to receive mention by authors like Ralph Fletcher, Penny Kittle, along with many others in the greater conversations about teaching writing. Uncover this book’s gifts in great company, your writing colleagues, and you will be amazed at what you discover as a writer and teacher of writers. I'm thrilled to be presenting at CSU Stanislaus this afternoon! We will begin the session with Word of the Day which was the subject of my last blog post. 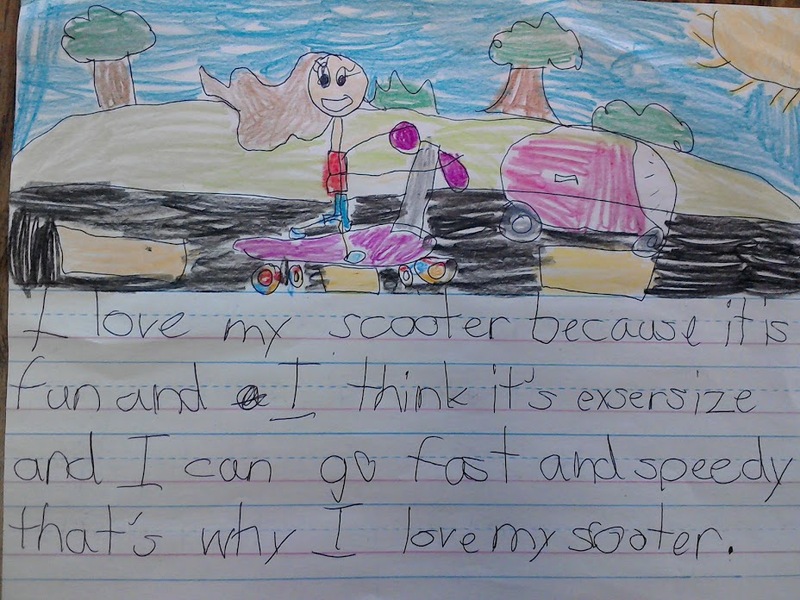 Take a look at what one of my students wrote about the word of the day, "fast." What is the word of the day? Well for first graders in room 13 it's not just about the word, it's all about living the life of writers. It's about possibilities and a playful look at language, Most importantly, it's our warm up for writing workshop. If you've participated in the Great Valley Writing Project's Summer Invitational Institute you know about word of the day. Kathy Harvey was the keeper of words during my Great Valley Summer Institute. Each day she revealed the word of the day and we wrote whatever we wanted for about five to ten minutes. Next, volunteers shared their writing with the group. The warm regard and support for each other encouraged us to take risks and for me, the risk was sharing in front of a group. Sharing had rewards--feedback which often was the catalyst to pursue a topic further. For me it led to my narrative for our summer anthology. I knew that Word of the Day should have a special place in the classroom. However, I didn't know how to start it in first grade, a grade I hadn't taught before. It wasn't until my third year teaching first grade that I placed it prominently in our day--first thing every day. Now Word of the Day happens without fail, even on Tuesdays when we only have a few minutes to spare before heading out for PE. Why did it take so long for me to implement this wonderful writing activity? I don't know, but persistence is the key. You need to give it time and you will see the value as you listen to students share or look over their shoulders and see the growth they make. My recipe for word of the day requires very little preparation. You will need one word for each day, paper, and pencils. A word of the day journal or space in a writer's notebook will help keep the seeds for stories in a safe place for further exploration. Students enter the classroom each day and record the word of the day and the date. Then they write whatever the word conjures up for them. Everyone shares their writing with an assigned partner at their tables. Then the helper for the day at each table may share using the class microphone--a new spin that is very popular! Participating in Teachers Write inspired the theme for this year's digital writing club at the school where I currently teach first grade. The theme for our culminating event showcasing student work is called The Poetry Cafe. The club will begin this week and run through mid March. Keep posted as this new writing journey begins. 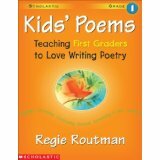 Thank you to Regie Routman and her series called Kids' Poems for helping me lay the groundwork for this year's writing focus, free verse poetry. Click on the picture below to find out more about this series. She has a book for each grade, kindergarten through fourth. I was on the road to Louisville, but I did read the prompt which lead to new ideas and insight into researching and how to stretch beyond writing about people you already know. I've included the link below for more information about the author. Although I struggled with the quick write, I gained valuable insight from the process. Instead of posting my work I commented on a post and read through so many creative examples from the other campers. The examples lead me to the conclusion that I might need help organizing my thoughts with a graphic organizer for the senses. Then I could build better descriptions. Also, reading the posts made me realize that I needed to get to know my characters better in my mind and have a clearer picture of the person and how they would feel and act in the setting. The process of reading examples and the comments from the author have helped me develop my reading like a writer skills. Working the same setting with the 3 different characters helped me to read and examine texts with a sharper eye. I dfinitely need to further develop the setting in a personal narrative about not giving up. This is a great lesson to include for a small moment story mini lesson. Happy Monday! I'm back at camp, but today I'm writing from a new location, Lexington, Kentucky--beautiful part of the country---rolling green, green hills. However, I am quickly learning that all this green countryside comes with a price, humidity and severe thunderstorms! At the end of this post, you can find my poem responding to a writing activity from author Liz Garton-Scanlon at Kate Messner"s blog post for July 13, 2015. Follow the link If you are interested in today's activity. Her lively lesson will have you composing poetry right away. I'm inspired to write more poetry, and I am definitely planning a first grade poetry unit. The purpose of the poem below is to capture a memory of a little train trip in Versailles, Kentucky yesterday. Clickity Clack, Here we go!